Kirarin Revolution (English: Sparkling Revolution) is a 14 volume manga series by An Nakahara published in the Shojo magazine Ciao. It was also adapted into a 153 episode anime series in 2006 and became the vehicle for propelling 14-year-old Morning Musume member Koharu Kusumi into stardom. The story follows a ravenous 14 year old named Kirari Tsukishima, who spends most of her time preoccupied with food and eating. She does not pay much attention to anything else but this. However, things changes when one day when she saves a turtle and ends up meeting a boy named Seiji. As a reward for saving his pet, he gives Kirari a ticket to a concert for the idol band SHIPS. When she tries to go to the concert, though, she meets another boy named Hiroto, who destroys her ticket, telling her to stay away from Seiji because they are two completely different people. When Kirari sneaks into the concert, she find out what he means by this; both Seiji and Hiroto are in the band SHIPS. Determined to win Seiji's love and become part of his world, Kirari begins her quest of becoming an Idol Singer. All Girls Want Bad Boys: Kirari ends up with Hiroto. Aww, Look! They Really Do Love Each Other: Kirari and Hiroto. Well, it was pretty obvious, despite them being on bad terms earlier on in the series. Balloon Belly: Kirari in episode 91. Big Eater: Kirari can eat dishes the size of her own head. Childhood Marriage Promise: Arashi has delluded himself into thinking he has this with Kirari. Civilized Animal: The series loves them. For starters, SHIPS is managed by Nezumi who is a mouse. Cloudcuckoolander: Seiji is a little... out there. Continuity Nod: The lyrics to "Koi Hanabi", the first Ending Theme Song of the anime, appear in volume 5 of the manga. Everything's Better with Sparkles: Kirari's debut song is "Sparkling Revolution." Girlish Pigtails: Kirari wears these. So does Erina. Hammerspace: Where the heck does Arashi keep those sea creatures? Hollywood Tone-Deaf: Kirari until she fixes it. Apparently it runs in the family. House Husband: Hiroto looks after his younger brothers and can cook and sew very well. Idiot Hair: Kirari, who is very ditzy and lacks common sense most of the time. Idol Singer: Seiji and Hiroto are in such a band. The main force behind in the series is Kirari becoming one. Intellectual Animal: Na-san is awesome at math and English. Long-Lost Relative: Na-san, Na-yan and Mya-san are brothers. Love Triangle: One happens between Seiji, Kirari and Hiroto. Massive Numbered Siblings: Hiroto is the oldest of 5 brothers. Medium Blending: The anime took on 3-D animation around episode 105 and until its end. Miniature Senior Citizens: The most prominent of which is Kirari's grandmother. Missing Mom: Kirari's. It's because she left for Hollywood when she was very young. New Transfer Student: Kirari transfers into the school that Seiji, Hiroto and Erina attend in episode 10. No Celebrities Were Harmed: Hitomi Yoshizawa from Morning Musume appears in one of the Fillers in the anime. Non-Human Sidekick: Besides all the cats, there's Seiji's turtle and Erina's bulldog. Otaku: Seiji disguises himself as such often. Plucky Girl: Kirari doesn't let herself get down easily. Running Gag: Everything Kirari attemps to create, be it drawing, cooking or sewing, turns into a mushroom, or becomes mushroom themed. Whenever Kirari's grandmother fangirls over Hiroto or is mentioned, Hiroto suddenly gets the chills. Sacred First Kiss: In episodes 11-13, Kirari is mortified at the prospect of having her first kiss taken for a movie. Her father has a similar reaction and even comes down with a fever. All Played for Laughs of course. In the end, Hiroto manages to fake the kiss when a curtain blocks the camera. Shipper on Deck: Seiji supports Hiroto/Kirari. 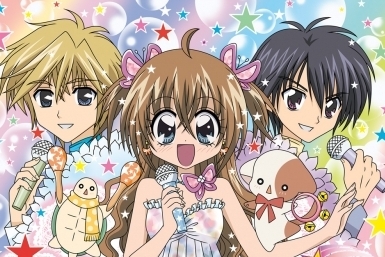 Sweet on Polly Oliver: In an early episode, Kirari disguises herself as a boy to go to an idol audition where SHIPS are acting as judges, the reason being that the audition is only accepting male applicants. She ends up attracting the attention of resident gonk Morita. Tall, Dark, and Snarky: Hiroto. More noticeable in the earlier episodes. After that, he gets a bit less snarky.